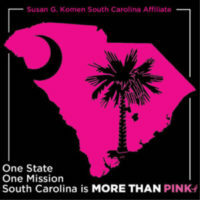 The South Carolina Affiliate of Susan G. Komen is an independent, tax-exempt 501(c)(3) organization. We are governed by a Board of Directors, representing the communities we serve. Up to 75 percent of net proceeds generated by the South Carolina Affiliate stay in our 45-county service area while the remaining 25 percent goes to the Susan G. Komen Research Grant Programs supporting research, awards and educational and scientific programs around the world. 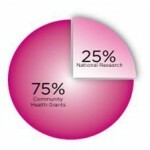 The purpose of the Affiliate’s Mission programs, including grantmaking, education and advocacy, is to provide access to quality care for those who face barriers to breast care services. The Affiliate has invested more than $11 million dollars in community health programs through grant funding to community nonprofits, as well as state and federal agencies. We’ve helped contribute to the more than $920 million dollars invested globally in ground-breaking breast cancer research through Susan G. Komen’s Research Program. These investments have been made possible through events like the Komen Lowcountry Race for the Cure® and Komen Mountains to Midlands Race for the Cure® and private donations. Komen South Carolina is not an endowed foundation and does not receive direct funding from our parent organization or the federal government. Komen Lowcountry has been a recipient of two grants from Susan G. Komen supporting community collaboratives and outreach programs. Komen’s Global Headquarters also provides advisory and support services for the Affiliate. We join more than 100,000 breast cancer survivors and activists around the globe as part of the world’s largest and most progressive grassroots network fighting breast cancer. Join us by calling our Charleston office at (843) 556-8011 or our Greenville office at 864-234-5035.